Camera Plus Pro, with 1 Million+ downloads since its release in Dec ’09, has been re-imagined to look and perform great with iOS 7. With completely overhauled graphics and a super efficient UX, it takes on a more modern approach to pro-like iPhone photography. Camera Plus Pro is now compatible with iOS 7. If you are observing a crash on iOS 7, than please follow these steps: Launch iPhone Settings app -- Privacy -- Microphone and enable CP Pro access. Well, the photo resolution setting option is back! - It's all the more easy now to zoom while shooting beautiful photos and videos in Camera Plus Pro. Simply use pinch gesture to zoom-in or zoom-out. - You won't find duplicate photos or videos in Camera Roll anymore, we fixed it! - We wanted to improve your experience while importing photos and videos from Photo Library. You can now choose the album from which you would like to import photos or videos. - You shoot beautiful photos from the powerful camera on your iPhone/ iPod touch in full resolution. So we removed photo resolution option under Settings. Fixed a bug related to 'live filters' showing junk previews in some of the devices. - Use volume-up button on the device/headphones to capture. Works with iOS 5. - Fixed a bug with video orientation issue when uploaded to Facebook. - Enabled audio in the video playback, when the device is silent mode. This follows the default iPhone behavior. - Fixed a bug where transferred video was not playing audio on the Windows PC. - Removed support for Bing image search. ** Introducing Live 'Soft Flash' for iPhone 3GS and iPod touch. iPhone 3GS and iPod touch users will not miss flash anymore! Just turn on the flash on your app screen and you can now preview photos with the 'Soft Flash'. You can see a great difference in the clarity of photos in low-lighting conditions. 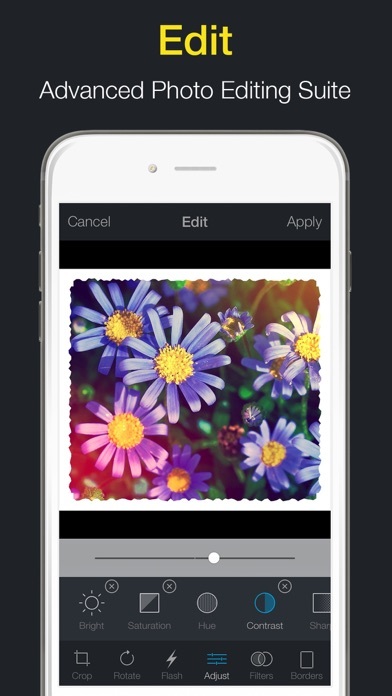 ** You can now crop your photos with one touch. Aspect ratio based crop will now make it easy for you to adjust what portion to keep in the photo you clicked. If you find this limiting, you can always use the free form crop! ** Re-touching your other photos in the Camera Roll and beautifying them with filters is going to be less time consuming! You can now import multiple photos from your Camera Roll to Camera Plus Pro. The app anyways offers you real-time fast editing and an instant comparison when you apply beautiful filters on them. ** You could always add a note or copyright text to your photos. We just increased the font size to make it more legible. - iPhone 3GS & iPod touch users would also enjoy the full resolution live photo filter feature. - Algorithm of the 3rd level 'Soft Flash' in post editing is changed. The clarity of the photos in the dark is going to be amazing! - Burst Mode and Timer can be activated at the same time. This means, you can now set a count-down timer and be a part of the photos! - Copyright text has been changed in Settings. Now the text contains only this (c) symbol for all the new photos that you would be taking. - Fully compatible with iOS 5. 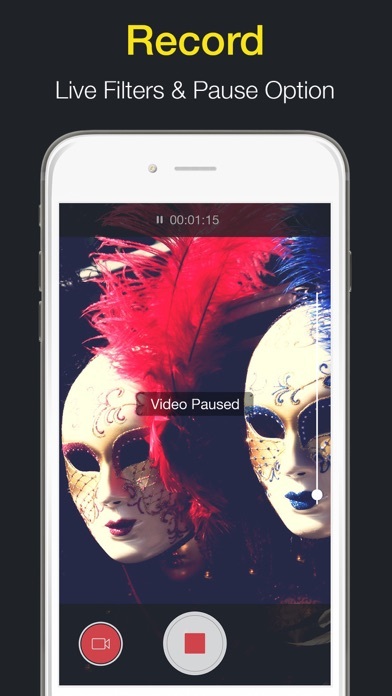 Enjoy photo capture and video recording with live filters. - Fixed photo resolution issue specific to iPhone 4 with iOS 5. You can now capture full resolution photos on your iPhone 4, and capture high resolution photos (2048x1529 pixels) with live filters. Camera Plus Pro v4.0 is the next level of iPhoneography. With this upgrade we have pushed the boundaries possible on an iPhone and have brought to you many unique features never seen before on the App Store. Get ready to be amazed and amaze! - We like to spoil all you awesome iPhoneographers. So we have added an amazing collection of 18 LIVE Photo and 9 LIVE Video Filters!! - We've also let you preview how the next live filter would look like on your photos and videos in Full Screen, with a gentle 2-finger swipe on the screen. - If you are like us and love to tweak your photos, you are going to love the cool new slider that lets you vary the intensity of the filter applied to your photos. - We also know you like to capture and save your photos and videos quickly, so we have made the app super fast by 30x in all the actions and polished the UI to make it look sleeker than before. - The video recording has been re-written from the scratch so that you can now record amazing videos with live filters of 640x480 dimension in any orientation. - With our new video zoom slider, you can get that extra smooth zoom that you always wanted in your videos. And, the videos are being recorded at 17 fps on your iPhone 4 and iPod touch with camera, while 16 fps on your iPhone 3GS. - The existing photo and video filters have been tweaked further and you are going to simply love how they now look like on your photos and videos. - No one likes bulky videos, so we now compress your videos before you upload them and the recorded videos save almost instantly. - We now have a gorgeous new single login page for all you social networking lovers, so that you can log in to your favorite sites and start sharing in a jiffy. - Regarding the Facebook login issue, we have fixed it for now, until they try to break something again! - Facebook Sharing issue resolved. If you are still having problems with uploading to Facebook, follow these steps. From your Facebook Account -> Privacy Settings -> Apps and Websites -> Edit your Settings -> Remove the app Camera Plus Pro. Then, launch Camera Plus Pro from your device and re-authorize by logging into Facebook. - 21 stunningly beautiful new Photo Filters such as Coffee, Washed, Retro Green, Pop, Arsel, Antique, Rust and many more for iPhone 3GS, 4 and iPod touch. - 9 Distortion Filters for iPhone 3GS, 4 and iPod touch to add some amusement to your photos. - You can preview the before-and-after state of the image just with a tap without leaving the existing screen, a huge advantage when you want to do a quick comparison. 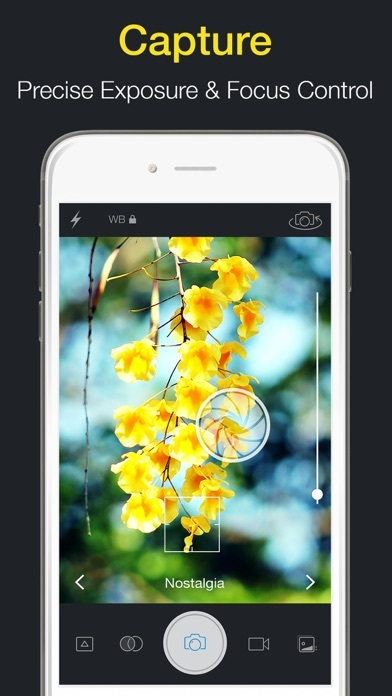 - White Balance lock for capturing the right color on your iPhone. You now have independent control for white balance and touch exposure settings. - Grid Lines are now available for Burst Mode as well as Video Recording Mode. - Flash, White Balance and Zoom Sliders get hidden if the Capture Screen remains untouched for 6 seconds. - As always there are some other minor UI refinements and bug fixes that would help you get the best pictures/videos. On the occasion of the 1st Anniversary Celebration of Camera Plus Pro on the App Store, we have not just provided the app with a stunning new bold look but have also re-defined simplicity and convenience of photography and video recording on your iPhone/iPod touch! In this version, Camera Plus Pro has been completely re-written from scratch taking in all the feedback and suggestions regarding the UI and usability. It is totally a new app! - Video zoom for all the iPhone devices and iPod touch with camera! - Edited photos are not overwritten on the original image, rather a new copy is created. - You can add/edit tags to your photos and videos. Searching is now easy. Terrific photo/video Ap. I love the video pause and zoom features! Wish I could get images to store directly into Photo Plus that comes with IPhone! I also wish I could have more control over the light, both low light and bright light! I just took a picture of the first quarter moon and it looks like a burned out full moon! I would imagine that is something Apple would have to fix with hardware! It works as well as the first day I bought it. A slight hesitation in the app here and there, but works great. Very good camera app. Easy to post and share your pics.